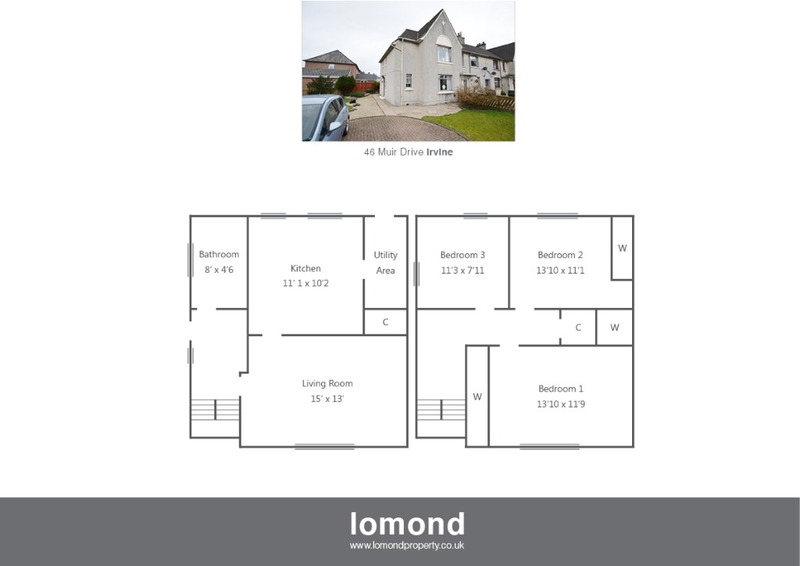 Situated just a short walk from the town centre, and located on a sizeable plot within a cul de sac, 46 Muir Drive is a wonderful family home comprising three double bedrooms, lounge, dining kitchen and a family bathroom. Externally the property boasts off street parking for 2 cars, and private gardens to the front and rear. Viewing is highly recommended to appreciate the room sizes throughout. In summary the property layout extends to a spacious and welcoming hallway with stairs to the upper level. The family bathroom is a recent upgrade, finished to modern tiling with bath, over shower, WC and WHB. The front facing lounge is generous in size with neutral colours throughout, log burner and in turn allows access to the rear of the property, where dining kitchen comes well stocked with floor and wall mounted units, integrated gas hob, oven and hood. Access to the rear garden can be gained via the kitchen. The upper level houses three bedrooms all of which are doubles. Bedroom 1 & 2 benefit further from fitted cupboard space, with a further storage cupboard off the upper landing. Externally the property has grounds to the front and rear. To the front there is off street parking for 2 cars, and a section of lawn with mature shrubs. To the rear the garden is again generous in size, laid predominantly to lawn with brick garage and perimeter fencing. Muir Drive is a pleasant residential area. Irvine town is close by and provides access to a range of amenities including supermarkets, bars, restaurants and town centre shopping. There are a number of local primary and secondary schools within the greater Irvine area.